Enjoy the Christmas the warmth and glow of Christmas tradition before boarding your Suite Ship®. 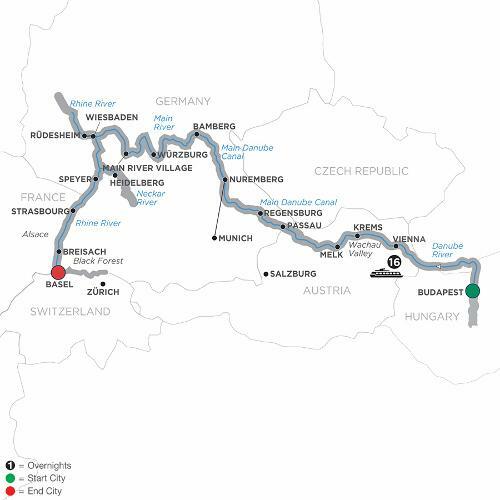 Your Danube River cruise embarks from Budapest—Hungary’s “Pearl of the Danube”—with an overnight cruise to Vienna. You’ll also see the historic Vienna Opera House and stunningly beautiful St. Stephen’s Cathedral. Continue to Nuremberg, and Bamberg with its glowing Christkindlesmarkt—complete with dozens of nativity scenes of every size. Würzburg is the next stop on your Christmas river cruise through Germany. Savor the sights, sounds, and confections of Würzburg’s warm Christmas markets before sailing to visit a picturesque Main River village. You’ll continue your scenic river cruise on the Rhine River to see the shining Christmas markets of Germany, France, and Switzerland. Enjoy Heidelberg’s sparkling Christmas markets during your stay, before sailing for Strasbourg, France. City sightseeing includes Strasbourg’s stained-glass, gothic cathedral, astronomical clock, and La Petite France district. Take time to browse the French winter markets with festive lights. On to Breisach and the Black Forest of Bavaria to experience generations of warm and festive Christmas traditions. From Bavarian bretzels to Black Forest Cake and mulled wine, you’ll feel the Christmas spirit in the idyllic setting of the Black Forest. Your Christmastime river cruise will conclude in Basel, Switzerland. With Christmas celebration and special traditions large and small, you’ll keep the visions of your scenic European river cruise in your memory for many Christmases to come.